Caliper Life Sciences Zymark Benchtop Twister II Robotic Microplate Handler 2 . New Life Scientific, Inc. This Twister II Microplate Handler is verified to be in great working condition by our in-house technical staff. The cosmetic condition is excellent as well, showing little to no signs of wear or use. The Twister II connects and communicates with the iLink software flawlessly. 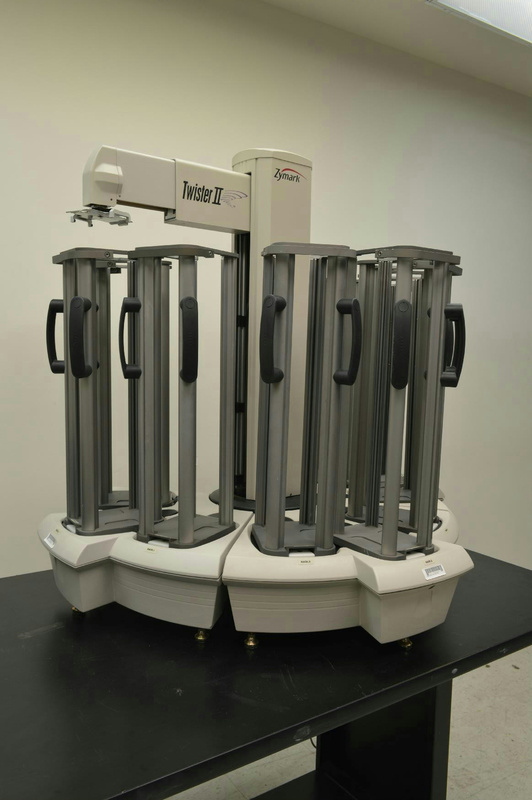 The Twister II Microplate Handler is a high capacity plate stacker with a capacity of up to 400 microplates. The robot can be jogged via the iLink software (a point and shoot interface) or manually. The robot has 5 axes, 340° of rotation, and is fully automated. This Twister II in particular has 9 racks and is able to retain the max capacity of 400 microplates. A new rack mount and vibration dampener were added to this system. Additionally, the necessary iLink software CD, 1 each three-rack controller base, 2 each three-rack base, 9 tall stacks, and serial cable are included with purchase. Excellent working and cosmetic condition.